I would say "almost perfect", but then again I'd have to pinpoint what isn't perfect about it and that's a big challenge. 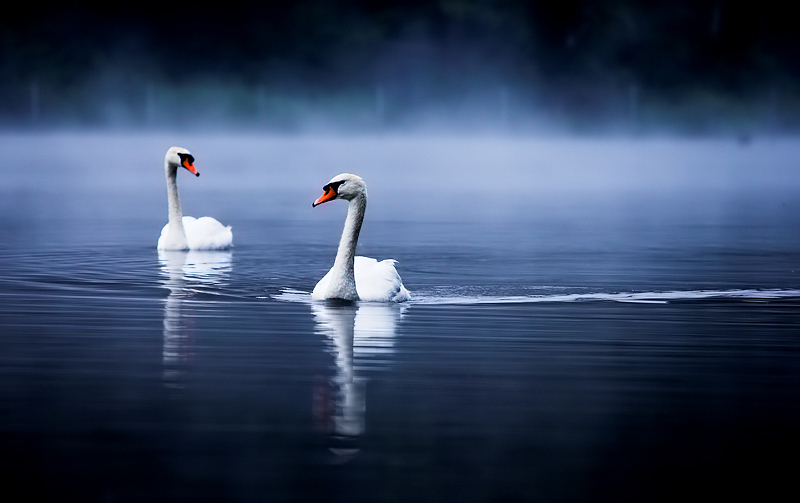 Spectacularly beautiful image, pair of swans, mist, ripples and reflections in the water. Thanks for sharing your wonderful photography and images such as this. Lovely - and of commercial value. This is an amazing shot. If I ever came up with a picture like this I could probably put my camera away and be content forever. Beatiful colors, amazing detail and a perfect timing of a wonderful balance between the two swans. Dang I am jealous. Beautiful photograph. Love the placement, angle, colours and detail. really love this outtake as well. great work! this looks very beautiful, i like the processing. Just stunning!!! Great focus and beautiful colors. That's a very charming photo, Alex. Better than your swan challenge entry. The colours, depth of field, background all make this image outstanding. I wouldnt say it is really as "Zen" though? Proudly hosted by Sargasso Networks. Current Server Time: 04/20/2019 06:16:51 PM EDT.